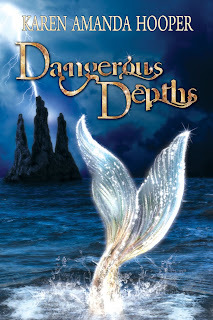 Welcome to the Dangerous Depths blog tour! Check out my review of this book, read the teaser, and enter to win the book below! Enjoy! You all must know by know that I am a huge fan of Karen and her books. She's a Baltimore native, her books are amazing, the covers are gorgeous, and she's super fantastic. What's not to love?! Well, congratulations on your fourth AMAZING release, Karen! It's sad that this is the first novel of hers that I am reviewing, but I've read the others, and I love them. Tangled Tides is my favorite, but this sequel did not disappoint. If anything, this sequel is almost as fabulous! One of the brilliant things about this book is that you don't really have to remember much from the first book to read the second one. I didn't really have a hard time getting back into Yara and Treygan's world. Hooper doesn't really recap events of the first book all at once in the beginning, like most authors do with sequels. Rather, she lets information flow gently into the book, naturally, so it never feels like there is an info-dump anywhere. But, it's clear enough that you recall major events from book one. This is important to me, because I didn't re-read book one before reading this one. Anyway. Rownan, Treygan's brother is determined to get his wife back. Vienna is stuck in a hellish place called Harte - and yes, it is literally hell. Yara, Treygan, and Rownan set out to find this impossible and terrible place, bring Vienna back, and somehow, do all of this without losing their minds, or worse, their lives. Such an interesting premise. Definitely not a what I was expecting, when the synopsis was first revealed, but I was intrigued nonetheless. I was expecting something more related to the overall plot with Yara and her strange being, but I was pleasantly surprised to find that while going to Harte did not have to do with Yara and her role in the general plot specifically, it did have much to do with the general plot of the series. This is good, because sequels are the books that step into the overarching plot of the series. In the first book of a trilogy, the protagonist gets a taste of the different, unique life into which he/she has been thrown. In the last book of a trilogy, the final showdown takes place. So, bravo to Hooper on that aspect - subtly keeping to the grand scheme of things! Yara and Treygan are not quite at the forefront of this novel. I was surprised to find that this book was written with not one but three first-person perspectives - Yara's, Rownan's, and Nixie's. All three perspectives are very important, and I think it will be interesting to see how each character plays a role in the final book. With the exception of one. No spoiler. While Yara and Treygan are not at the front and center of this book, they are still very, very important. Their relationship grows beautifully, just as the relationship between the two protagonists should, in a sequel. I love that no love triangle has been introduced - sort of. I have a hard time believing in anyone but Treygan and Yara. The plot is so bendy and twisty! At times, it dragged a little, but I found that for the most part, I was flipping through this book, wanting to know what would happen next. Most of the book takes place in Harte. A good way to think of Harte is Davy Jones' Locker (if you've seen Pirates of the Caribbean). That is exactly what I thought of, every time Hooper described a part of Harte. On that note, the imagery is SUPERB in this book. The descriptions of everything is so beautiful and captivating. Even those of Harte, of the nasty, haunting place, had its on luster. Hooper has a way of describing things - you can really picture it in your mind. Suffice it to say, I really enjoyed this book! I mentioned this before, but I found that the plot dragged at times. The beginning definitely is slow. It took me about 30% to really start getting into the story, and about then, the team entered Harte. So, if you're having trouble starting and finishing this book, fret not, because it does have a slow beginning. YES! I most certainly would! If you loved book one, you'll love book two. If you're contemplating reading this series, do it. The first book, and the sequel, are FANTASTIC. And if you didn't like book one... try again. You might find that this series is quite epic. 4 stars. I cannot wait to read Sacred Seas! November 2014 is too far away. YAY! I'm slightly embarrassed that you read my review lol. Thank you for commenting, Karen! And you're so welcome, for everything. You are amazing! I'm my goodness. Why are you embarrassed? It was fabulous! I'm very enthusiastic to read this one and I appreciate your thoughts so I'll know what to expect. Thanks for sharing! Excellent! I'm glad to hear that, Sophia. You'll love this one!